Climate change will begin altering water levels in the Ganga and the Brahmaputra in the next three decades, and after 2050, the rivers could record an abrupt decrease in flow, according to a study on the Hindu Kush and Himalayan region that predicts disruptions which could jeopardise agriculture and access to drinking water. The findings are part of the 600-page report from Kathmandu-based International Centre for Integrated Mountain Development, which includes 210 authors who studied the ecology of the Hindu Kush and Himalayan region. 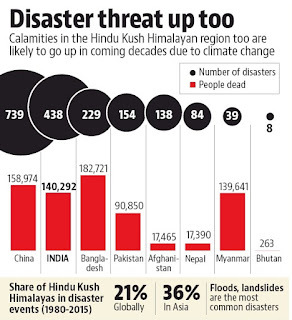 The report predicts that a third of glaciers in the HKH region will thaw if average global temperatures rise by 1.5°C. For the Ganga, Brahmaputra and Indus, the report adds that water flow will gradually rise till 2050 before they start to plummet. This, the assessment adds, will consequently diminish the water available for drinking, irrigating farms, and producing electricity for roughly 250 million people living downstream. “Although increases in meltwater are likely for the next few decades, melt water volume is likely to decrease abruptly once glacial storage is reduced,” the assessment said.